Although we shared much Fun and Laughter in Retirement, some incidents were less enjoyable. Expertly using the mooring ropes, Eric manoeuvred the boat and, with my help from above, pulling the main rope towards me with my crooked umbrella handle, eventually he reached the wall safely and he told me to go shopping. When I returned, I found Eric standing mournfully on the promenade, dripping from the chest down. ‘Look’ he said, and I saw our little boat submerged below us; it was such a sad sight. Eric decided we’d wait until the tide had gone out fully, so he could bale her out. Crossing the road we entered the cosy foyer of the Royal Castle Hotel. 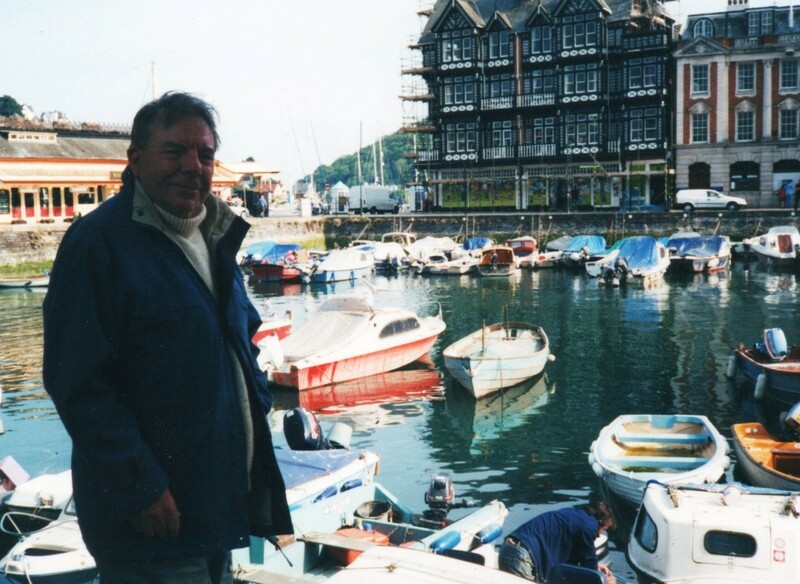 Eric squelched away to the Gents, dragging a bright blue recycling bag containing his boating gear which he had refused to change into before the escapade, despite – or maybe because of – my entreaties to do so. I adjourned to the bar and Eric joined me looking forlorn and chilled. After a warming brandy, he agreed he was too cold to do any more so we hastened home with heater on full blast, planning to return at dawn the next day to bale out the boat at low tide. Before bedtime I used the washing machine cycle twice, getting into bed at 12 am. At 5.15 am I awoke to find Eric getting dressed. ‘I’m going alone’ he said firmly, but I sleepily insisted I would come too. I daren’t let him go without me! Just as well; it was the highest of low tides, and there were still a few inches of water. Although we wore many layers of clothes I was unprepared for a gale-force wind – a foretaste of what was to come – and I could hardly stay upright it was so strong. The plan was to empty the boat of everything we could and we had gone well prepared. 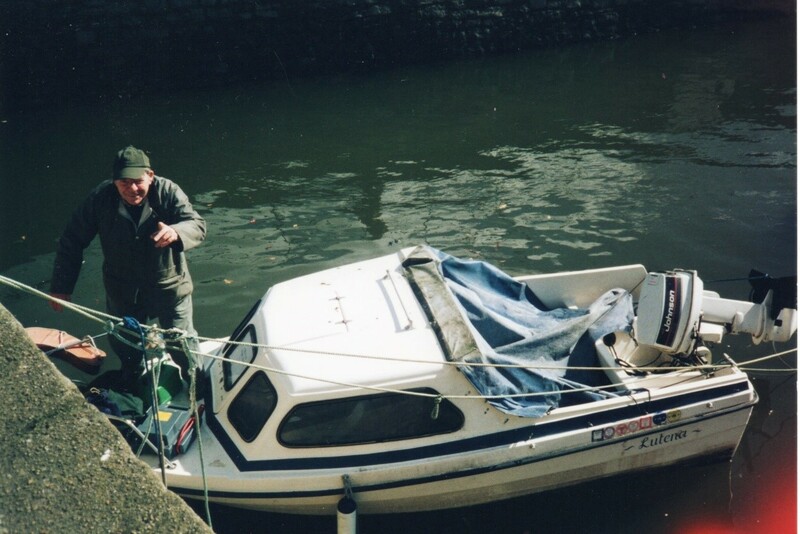 I found myself at 6.30 a.m. lassoing a rope down to Eric whilst he, with icy fingers, knotted it around first the anchor and then the various items of (brand new) cushions etc, which weighed a ton having been waterlogged. Up on the promenade I braced myself and heaved away time after time until everything was piled up soggily beside me; the umbrella handle was invaluable for the task and a man nearby kindly assisted, instead of just watching us. A magnificent sunrise over the timbered rooftops took my breath away, but Eric was crossly disinterested when I called for him to share my delight. Eventually, we wearily stowed the bulging sacks in the car and repaired to the Royal Castle Hotel which was open to serve breakfast, and at 8 am we sat beside a log fire sipping strong coffee and feeling restored. Baling out had been impossible but, to my relief, the Overseer of the Boat Float agreed to finish the job, and Eric later took an engineer friend to retrieve the engine. The Insurers paid up, so a memorable adventure ended happily and, after a while, Lutena was afloat once more and ready for action. This entry was posted in Book and tagged fun and laughter in retirement. Bookmark the permalink.